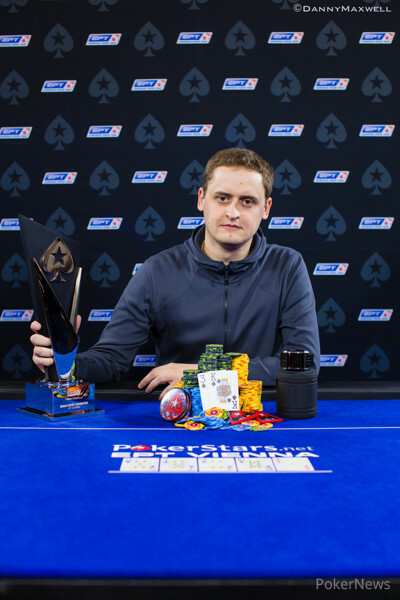 After a six-day battle in the stunning Hofburg Palace in downtown Vienna, it was Oleksii Khoroshenin who was crowned the PokerStars.net European Poker Tour Vienna champion! Khoroshenin was the Day 1a chip leader and he managed to carry his success all the way through to the end of the tournament. 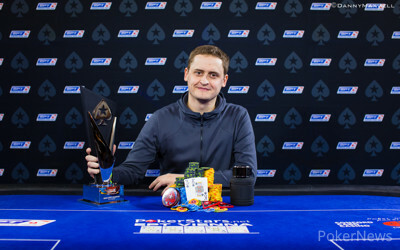 With this win, Khoroshenin became the first-ever Ukrainian EPT winner, but more importantly he walked away €578,392 richer after beating Austrian Anthony Ghamrawi heads up. Going forward, Khoroshenin may also show off the beautiful trophy and a stunning watch worth more than €5,000 from luxury Swiss brand SLYDE, the official watch sponsor for EPT Season 10 main events. The final table kicked off with tons of fireworks as Marko Neumann won a big pot right off the bat. Danish high-stakes online pro Frei Dilling fired into Neumann on two streets with an inferior hand and that ended up costing him right away. On the very next hand, another clash played out as Pablo Gordillo called down Timo Pfutzenreuter, who had made a straight on the turn. So after just two hands, it was clear that nobody was just going to run over this stacked final table. About 30 minutes later, it was Pfutzenreuter who tried a big bluff on his fellow countryman. Pfutzenreuter fired three barrels into Neumann, but on the river Neumann check-raised all in with a full house and Pfutzenreuter snap-folded himself down to being one of the shorter stacks. A few hands later, Neumann grabbed the lead and that gave him enough chips to constantly pressure his opponents. The lead wasn't in Neumann's hands long, though, as Ghamrawi picked off a pot from Gordillo and right after that took another huge one from Simeon Naydenov. It wasn't the World Series of Poker bracelet winner's day, and the big bluff that failed was detrimental to his fortune at the final table. Naydenov was called down by Ghamrawi's king-high, and after this hand he had little to no room left to get creative. Despite the high-paced play, it still took over three and a half hours before the first player was knocked out. Bulgarian player Rumen Nanev was first to go as he ran ace-king into Khoroshenin's pocket queens. The board proved to be no help to the ever-smiling Nanev, who exited €77,000 richer than at the start of this week. The next player to go was quite a surprise to all players at the final table, as Dilling ran a huge bluff which cost him his tournament life. Dilling three-bet preflop holding king-seven of clubs and Neumann called out of position with ace-four of clubs. Both players flopped a pair with their highest card, but Dilling decided to turn his pair of kings into a bluff by firing all three streets. Neumann reluctantly called Dilling's shove on the river after he had made two pair on the turn, and that spelled the end for the aggressive Dane. Dilling walked away with €108,100. After Dilling was knocked out, play slowed down again and both Khoroshenin and Neumann kept picking up more chips. In sixth place, it was ultimately Naydenov who got knocked out as he lost a vital coin flip with ace-jack of spades versus Ghamrawi's pocket tens. The Bulgarian pro walked away with a nice €151,000 payday, but it was quite obvious that he wasn't too happy. After Naydenov hit the rail, it was Khoroshenin who managed to chip up into the chip lead, as he managed to win a few pots off Neumann. Meanwhile, Pfutzenreuter awaited his chance to move all in, and when he finally did his pocket sixes were no match for Ghamrawi's sevens. 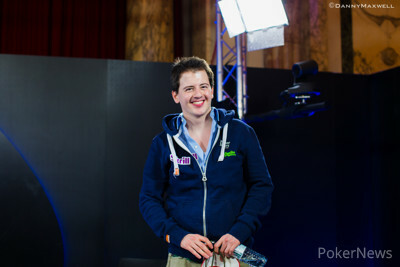 Pfutzenreuter took home €203,900 for his stellar performance, as the book was closed on his final table run in fifth place. The final four did not stay together for too long, as the man eying the first-ever Spanish EPT victory hit the rail about 20 minutes later. Gordillo played an 80-big blind coin flip with ace-king versus Neumann's tens, and that did not go his way. Neumann regained the chip lead due to this hand, and Gordillo went on to collect €262,150 for his efforts. During three-handed, play chips went back and forth a little bit before the dinner break started. After the dinner break finished, a deal was discussed and the final three players agreed to the following numbers with €50,000 left to play for. Three-handed play was furious, but there were no victims for several hours. Eventually, it was the long-time chip leader Neumann who got crushed by Khoroshenin in consecutive hands. In a full-house-over-full-house situation, it was Khoroshenin who grabbed the lead, and on the very next hand it was all over for Neumann. 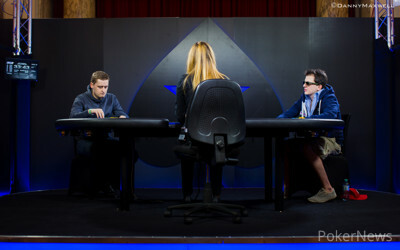 The German pro was the favorite for most of the final table and he ultimately walked away with the biggest payday during this event due to the three-handed deal. 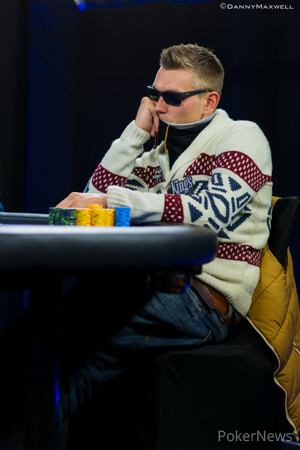 Neumann collected €638,127 and Khoroshenin started the heads-up battle with a huge chip lead. Khoroshenin started heads-up play with 20.7 million to Ghamrawi's 6.5 million, but it would take some time to finish the deal. After a 45-minute battle, it was Khoroshenin who managed to cash in on his chip lead and he knocked out Ghamrawi. Ghamrawi walked away €446,481 richer while Khoroshenin was crowned champion, which meant a €578,392 payday, the trophy, and the SLYDE watch. From everyone here at PokerNews.com, we would like to thank you for following our coverage, and we would like to welcome you to the epic conclusion of 10th EPT Season in Sanremo and Monte Carlo where we'll be providing the live updates from start to finish again. See you again in April! Oleksii Khoroshenin opened on the button with for 380,000 and Anthony Ghamrawi made the call with . Ghamrawi checked and Khoroshenin made it 450,000. Ghamrawi then check-raised him to 1,225,000 and faced a reraise from Khoroshenin to 2,500,000. Ghamrawi had a last look back at his cards and announced he was all in. Khoroshenin called and they were essentially flipping. The turn sealed it with the flush and a meaningless fell on the river. Ghamrawi was knocked out and Khoroshenin was crowned the EPT Vienna champion! Anthony Ghamrawi opened on the button with and Oleksii Khoroshenin three-bet to 460,000 from the big blind with . Ghamrawi made the call and they saw a flop. Khoroshenin continued for 550,000 and Ghamrawi made the call. The turn card was the and they both checked. When the came on the river Khoroshenin checked and Ghamrawi went for a bet of 575,000. Khoroshenin made the call with just queen high and the pot was pushed to Ghamrawi. Anthony Ghamrawi raised to 300,000 from the button with and Oleksii Khoroshenin called from the big blind with . The flop brought and Khoroshenin bet 550,000 from the big blind and Ghamrawi check-raised to 1,180,000. Khoroshenin made the call and on the turn the hit. Both players checked and on the river the hit. The action was checked again and Khoroshenin showed the winning cards. Oleksii Khoroshenin opened for 380,000 with and Anthony Ghamrawi three-bet to 915,000 with . Khoroshenin made the call in position. They saw a flop of . Ghamrawi led with his pair and ace high for 875,000 and Khoroshenin let his hand go. Anthony Ghamrawi opened with and Oleksii Khoroshenin three-bet to825,000 with . Ghamrawi made the call. The flop was . Khoroshenin continued for 1,100,000 and Ghamrawi called. The turn was the and Khoroshenin shoved with the nut flush draw and over cards. Ghamrawi sighed deeply and let it go. The final two players are now on a short 15-minute break. Oleksii Khoroshenin raised to 325,000 from the button with and Marko Neumann called from the big blind with . The flop brought and all the money went into the pot within seconds. Neumann had flopped two pair against Khoroshenin's straight. The turn brought the and the river the and Neumann was knocked out! Marko Neumann opened in the small blind with and was raised by Oleksii Khoroshenin in the big blind with to 460,000. Neumann called and they saw an action flop of . Neumann checked and called a bet of 500,000 from Khoroshenin. The turn card was the and again Neumann checked. Khoroshenin went for 1,075,000 and again he got a call. The river card was the giving both players a full house but Khoroshenin had the best of it. Neumann checked and when Khoroshenin bet 2,675,000 Neumann moved all in and got the call.